A lab bench with containers and seeds, Ethanol and Bleach Wash in Background. 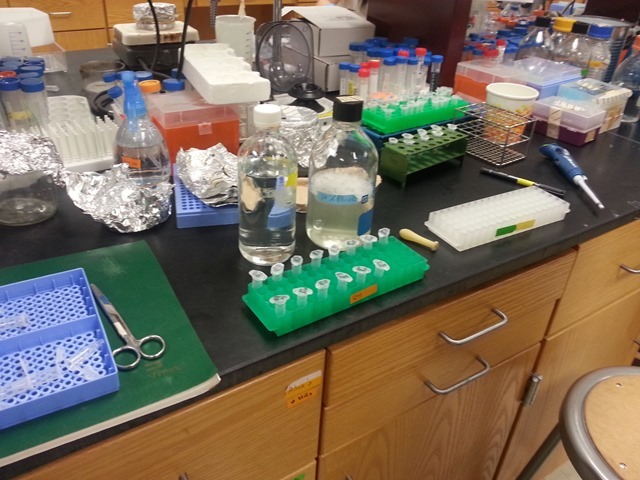 Today, I started my first day of working for my first day in Dr. Alice Cheung’s Pollen Laboratory at the University of Massachusetts Amherst. We started the day meeting with Dr. Cheung to discuss the schedule for the summer. The schedule is very dynamic because I am attending (or already have attended) STEM Digital Institute at UMass Amherst, STEM Nanotechnology Institute at UMass Amherst, and the NWABR Bioethics Course, amongst my hours in working in Dr. Cheung’s lab. We started the day learning how to do Arabidopsis screening with a T1 generation stock. 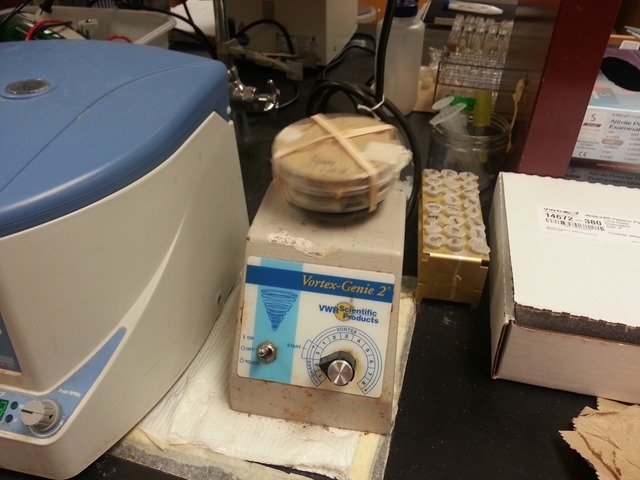 What this means is that the seeds that we are screening had an gene introduced by agrobacteria. 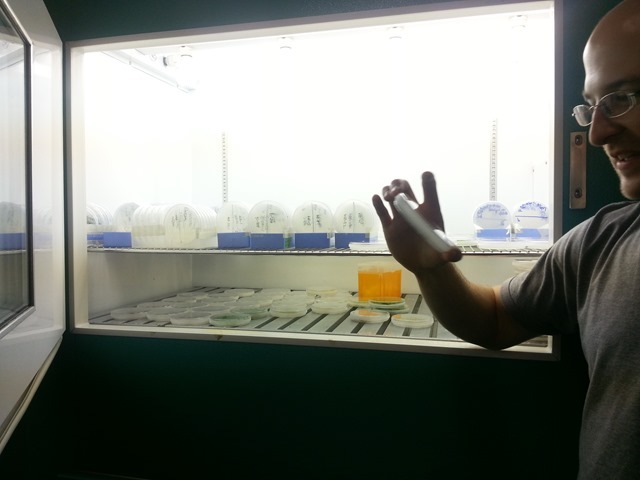 We use a medium with antibiotics in petri dishes, which helps us screen for the offspring that we’re looking for. The antibiotics affect (thus killing) the normal (called wildtype) seeds, while allowing the gene that we inserted (in this case RK11p:Gus) to survive, because we added antibiotic resistance in addition to the RK11p:Gus gene. 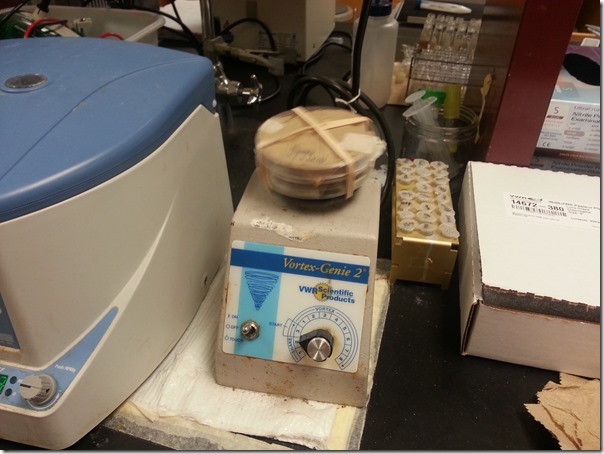 We wash the seeds before we put them on the medium in ethanol (twice) and a 50% bleach solution with detergent (once). 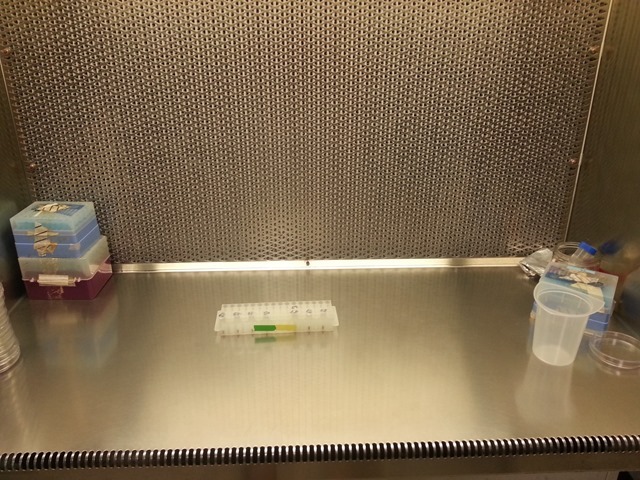 We then use a laminar flow bench to maintain a sterile environment, while rinsing the seeds with double-distilled water (4 times). We use this contraption to shake the seeds during the rinses. To standardize germination, the seeds are stored at 4 degrees celsius for 2 days- making the seeds believe it is winter. Then, when they are transferred to the growth chamber (at 22 degrees Celsius), a more uniform sprouting occurs. We prepared a number of RK11p:Gus plates, which we will be transferring to the growth chamber on Wednesday. Laminar Flow Bench for a sterile environment. 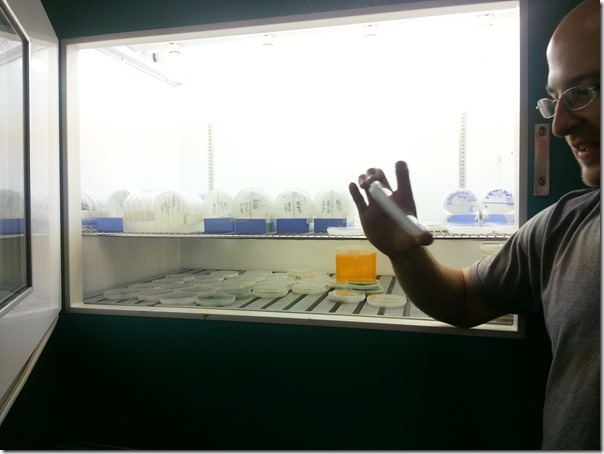 Eric Johnson in front of a growth chamber in the basement of Lederle Graduate Research Tower.